‘Remembrance of the Daleks’ to this day remains one of the most enduring classic Doctor Who serials, a reminder of what had originally made the franchise so beloved at a time when viewership and cultural significance were on the decline while also innovating with classic foes and introducing dynamic supporting characters alongside a thoroughly modern and proactive companion. Following those mysterious events at Coal Hill School, the British government has created the Counter-Measures group fronted by Simon Williams’s Group Captain Ian Gilmore, Pamela Salem’s Professor Rachel Jensen, Karen Gledhill’s Doctor Allison Williams, and Hugh Jones’s supervisor and government liaison Sir Tobias Kinsella in order to investigate strange phenomena and dangerous technology as a sort of proto-UNIT. With Jensen visiting Williams during an enforced holiday, the underfunded Counter-Measures officially comes together in Paul Finch’s ‘Threshold’ as the small group is sent to investigate a missing scientist and ghostly phenomena at a factory in Bermondsey and Jensen is persuaded to offer her expertise. The music and sound design do well to invoke the sixties espionage thriller sensibilities of the setting, and it’s a nice touch to not let it go unspoken that a Jewish scientist may have issues dealing with a German figure at this time. The seeming invention of teleportation technology that should not exist is an engaging premise, especially with the purported leaps of logic and lack of evidence in the science supporting it, but the rather generic and stereotypical antagonist fails to make full use of Rachel’s admiration for the flawed science at hand. ‘Threshold’ may not be the most original script, but it does manage to expertly set up the operating premise of this Counter-Measures series as a whole as features a collision of supernatural and science fiction with politics and humanity always in focus. That’s not wholly surprising since a pilot episode needs to put the protagonists at the forefront, and, although nearly a quarter of a century since 1988 does unavoidably bring with it changes in the leads’ voices, the four leads expertly step up to begin to intimate at the precarious situation in which Counter-Measures finds itself under the government’s eye while also quickly establishing the interpersonal relationships of these strong-willed individuals. It’s clear that this group will evolve as its members better learn of the strengths and foibles of each individual involved, but they intrinsically have an immense camaraderie and mental fortitude that together already make them a force to be reckoned with in this tense and emotionally heightened Cold War world where conspiracy and secrecy are on everyone’s minds. ‘Artificial Intelligence’ by Matt Fitton taps into the paranoia of social control that was so prevalent at the time and remains so even to this day. In a sign of a series already finding its voice and stride, the Counter-Measures group discovers a new Cold War weapon while investigating a suicide at the Sen-Gen Facility, in the process coming upon a Czechoslovakian former flame of Gilmore’s. The title makes no secret about the basis for this story, but the discussions about its potential benefits and risks as this intelligence begins to influence individuals’ behaviours in unexpected ways are neatly done and bring the scope of its power squarely into question. The villain of the piece is chillingly effective and affects the heroes in a much more personal manner than typical menaces are allowed, and the eventual resolution uses the relative new status of these characters to further define the heroes while bringing up wholly new questions about one team member in particular. As truly compelling as the fear and mistrust of others and oneself amidst questions of how to contain this sentience that was built to contact UK soldiers without detection are, however, ‘Artificial Intelligence’ is just as successful precisely because of the groundwork it lays for further exploration later in the series. This is certainly the case with Allison’s reticent partner, Julian, as played sincerely by Alastair MacKenzie who inadvertently comes into conflict with those older than he is who have been through war, but even some of the core team members’ actions will have undoubted fallout within such a tight-knit group and possibly beyond. It’s a bold choice to introduce so much early mystery and intrigue around characters who seemed to already be well-defined, but it also speaks to the multi-dimensional nature of these characters in a heightened environment where right and wrong is anything but black and white and in the process sets up anticipation for dynamic characters who will continue to evolve as their investigations uncover anything but the expected. ‘The Pelage Project’ by Ian Potter takes Counter-Measures to the town of Pelage to investigate a case of industrial pollution, the team then quickly discovering that its leader, Ken Temple, is hiding something much more sinister and overwhelming. Likewise tapping into the notion of social control, the science of Pavlov’s dog being applied to a community as a whole is a frightening proposition, especially as Temple proclaims that the conditioning is much easier in the younger community members who have never known better. And while there is the argument that this setup allows for efficiency and order to reign supreme, Temple soon makes it clear that he has a very unique outlook on life and its continuation into the future, his mannerisms and scheme at times approaching satire but his vision for genetic and environmental manipulation truly terrifying. Stephen Grief does well to avoid portraying the character as a stereotypical maniac, and the ambition and determination that Potter’s writing and Grief’s acting imbue into the character make him all the more unsettling and frightening. Politics again factor heavily into the progress Temple has been able to make, and the script wisely makes mention of the elements those in power are willing to look past when the money and circumstances are favourable. Although the resolution is quite routine and hasty after a nicely layered and nuanced setup and takes away an intriguing supporting character, ‘The Pelage Project’ again allows the regulars to shine as their characters naturally and progressively continue to develop. As the scope of the dangers they come upon continues to increase even if this one doesn’t have quite the same personal effect as previous ones, they learn and fight onward by continuing to draw upon their past experiences and their own intelligence and morality to ensure that political and single-minded machinations are not allowed to overtake the concern for the overall public good alongside the more intimate group of individuals at hand. ‘State of Emergency’ by Justin Richards serves as the first series finale as creatures from another dimension roam the streets and traitors rule the halls of Westminster. Building upon the events of ‘Threshold,’ Rachel has seemingly solved the secrets of the teleportation device, bringing with it a new source of pressure as the budget to the Ministry of Defence and thus Counter-Measures is threatened to be slashed during Harold Wilson’s rise to Prime Minister. However, as deadly mysterious creatures appear and a most un-British coup is revealed, friendships, alliances, and trusted figures are bluntly put to the test with Allison an unexpectedly devastated victim. This is certainly a more action-oriented story than the preceding three, but the intrigue and atmosphere are both as prevalent as always and combine to create a wholly thrilling tale of mistrust and deceit that comes to life spectacularly, and Duncan Wisbey does magnificent work bringing Wilson to life on audio. Given just how much events of this finale tie into previous events, the prerequisite knowledge never seems cumbersome or overwhelming whether listened to in quick succession or far apart. Instead, ‘State of Emergency’ features an intricately-woven plot that further expands upon what has come before while bravely telling its own story to remarkable effect. Strong coup stories need to feature a moral gray zone atop very strong personal beliefs and an environment filled with distress and paranoia, and that is absolutely present even without the science fiction element that only serves to heighten the tension further. Once more, the performances of all of the leads are superb, and they easily convey the needed sense of British fortitude and resilience even as their surroundings are thrown completely into flux. Whether standalone or as a finale, ‘State of Emergency’ perfectly captures everything that this series should be and expertly sets the scene for the widening remit of Counter-Measures going forward. Counter-Measures in a very short period has accomplished a very difficult task by resonating with theme and tone and by presenting another military-type group with a voice wholly distinct from UNIT and Torchwood, in this case by putting science at the front of science fiction as the titular organisation fights for recognition and funding. 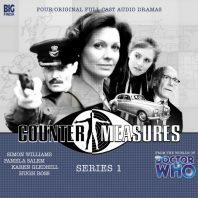 With a bit more of a deliberate pacing and a heavier emphasis on dialogue as Kinsella’s true motivations are furtively questioned throughout, this first series has perfectly captured the character-based, weightier dramas of the sixties and instantly proves that there is another corner of Doctor Who incredibly ripe for further exploration.